Home Tags Posts tagged with "lorry driver"
West Bank crash UPDATE. Palestinian president declared 3 days of mourning after at least 8 children died. President Mahmoud Abbas has declared three days of mourning after at least eight Palestinian children have been killed in a collision between a school bus and an Israeli lorry on a road in the West Bank. The school bus was carrying children as young as five or six on their way to Ramallah, just north of Jerusalem. The vehicle overturned on impact and burst into flames. More than 30 children were injured, and there are fears the death toll may rise. Israeli Prime Minister Benjamin Netanyahu has expressed his sorrow and offered assistance. The bus is believed to have been carrying up to 50 children at the time of the crash, which happened on a busy road junction. At least one report said a teacher had also been killed. In a broadcast, President Mahmoud Abbas described the accident as a horrific national disaster and said all flags would fly at half-mast. “The toll so far shows that more than 10 children have died and scores of injured are receiving treatment in various medical centres in the West Bank,” he said. The higher figure of the number of dead has not been confirmed. The children were apparently travelling from their school in the West Bank village of Anata when the two vehicles collided, head-on, according to reports. 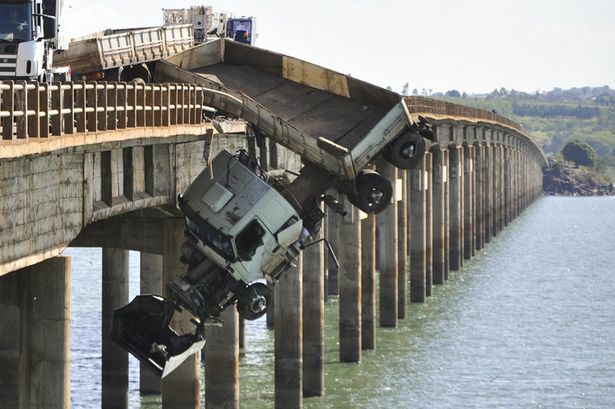 The lorry driver, an Israeli-Arab, was injured. 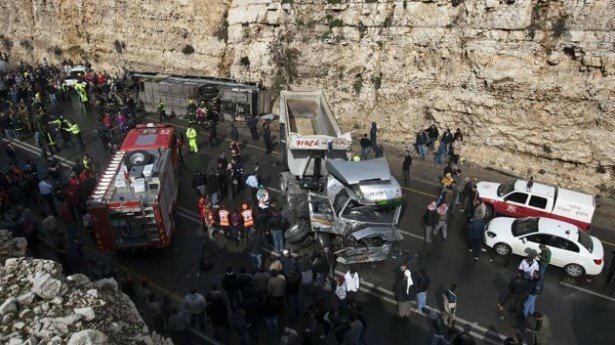 Dr. Ahmad Bitawi, director of Ramallah Hospital, said five children and a teacher had been pronounced dead at the hospital, while a further 54 people injured in the crash were treated there, Reuters news agency reported. Some of the survivors were also taken to Jerusalem’s Hadassah University Hospital. “It is an ugly, unbelievable, terrible accident; it shakes the feelings of the whole world because it includes babies,” Adham Al-Hindin, uncle of two injured children, told Reuters. The road conditions in the area were “pretty treacherous” following heavy rain overnight and the accident had happened during morning rush hour. Shalom Galil – an Israeli paramedic at the scene – also said the adverse weather conditions appeared to have been a factor. Shalom Galil said Israeli and Palestinian emergency services had worked closely together at the scene.